Make her feel ~extra~ special. Shopping for someone can seem like a daunting task. For one thing, unless you know each other really well, there are so many ways for things to go wrong. And if you’re romantically involved, do you get her something sentimental or practical? Spend too much and you might seem too clingy; but opting for the cheapest option might imply that you just don’t care. When it comes to gift-giving, how do you thread the needle when the expectations are high? ICYDK, it doesn’t matter if she’s into nudes or reds; every girl is always on the hunt for her next fave lippie. Make her life easier by gifting her a collection that’ll leave her puckers looking pretty! Plus, you’ll be saving her from the heartache of having to pick just one. Whether she’s packing for a workout class or a road trip, she’ll appreciate a durable and stylish backpack that fits all her essentials. Purses are gorgeous, but backpacks are a cool-girl staple she can use for years. These days, with all the photo editing apps available, some might argue that every person with a smart phone can be a photographer. Truth is, there’s still something special about capturing memories without being distracted by notifications and text messages. A vintage camera is a perfect gift for whenever she wants to temporarily go off the grid. Everybody needs a little alone time. If anyone knows the importance of a good selfie, it’s us Pinays; after all, the selfie capital of the world is in the Philippines, remember? Though she may never admit it, every girl in your life secretly wants her own ring light. And the funny thing is, it’s not for wild clubbing nights; it’s for when she’s bored at home and experiencing peak GGSS. Ever since the Korean craze started, 20-something girls have been dying to achieve that lit-from-within complexion their favorite K-drama actresses seem to have. Believe it or not, that takes a lot of work. She’ll need cleansers to remove her makeup, foaming scrubs to get rid of dead skin cells, toners, eye creams, serums, and moisturizers. And that’s just the tip of the iceberg! But if you want a present that she’ll definitely go wild for, you can’t go wrong with an SM Gift Card. Not only is it convenient for you and the lucky girl you’re giving it to, you’re allowing her the freedom to buy whatever she likes. And while it’s always the thought that counts, at least you’d know for sure she won’t be pretending to love your present. In fact, she can buy everything on this list! 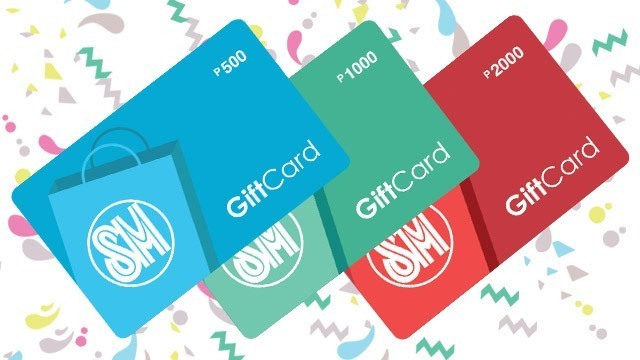 The SM Gift Card is available at the checkout counters of The SM Store, Ace Hardware, Sports Central, Our Home, Kultura, and Baby Company. You can use it at the following establishments: The SM Store, SM Markets, Uniqlo, Forever 21, The Body Shop, Watson’s, Our Home, Crate & Barrel and many more. Available denominations include P500, P1000, and P2000. For more info, click here.